Outfits have provided LoA2 players with powerful active skills for battle, and now the new Accessories will is bringing New Passive Skills as well! Through the Accessory system, players can craft their own Jewelry or Pendant and unlock powerful new passive skills to carry them to victory! Accessories come in different qualities; the better the quality the greater the stat bonus they provide. Players can replace their Accessories with better ones as they please. Each kind of Accessory provides a unique passive skill when equipped, as well as stat bonuses (stats bonuses remain even if after Accessory is unequipped). Access: Click the “Squad” Icon and select “Clothing”. 2.Accessories are divided into Jewelry and Pendants. Click on your desired accessory to craft it. You can only equip one of each type, so please choose wisely. 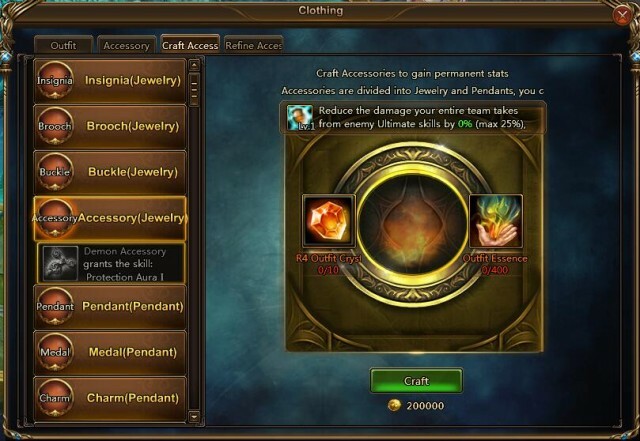 3.Crafting an Accessory will cost Outfit Crystals and Outfit Essences. X-Server Expedition, Guild Shop, Mall, and Events are the main sources to obtain these materials. If players are not satisfied with the stats on an Accessory, they can Refine them to get better stats. 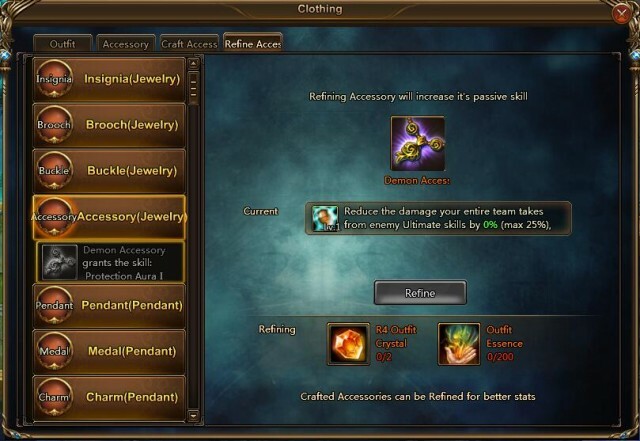 2.Refining an Accessory will cost a small portion of resources of crafting that Accessory. 3.If a stat is greater then the original stat after refining, then the new stat will replace the lower stat; if the resulting stat is equal or lower, than no changes will be made. Insignia: Increase max HP of entire team by up to 25%, lasts 2 turns. Brooch: Increase ATK of entire team by up to 12%, lasts 2 turns. Buckle: Reduce Initial Rage of all enemies by up to 150. Accessory: Reduce the damage your entire team takes from enemy Ultimate skills by up to 20%, lasts 2 turns. Emblem: When attacking, up to 24% of all damage done is returned as HP. Pendant: Basic attacks and Skills deal additional damage equal to (max 7%) of target's max HP, this damage is capped at 50% of your ATK. Medal: Gain an additional Rage (up to 200) each turn. Charm: When taking damage that exceeds 10% of your max HP, up to 35% of that damage will be absorbed. Next：League of Angels II Celebrates Independence Day: Mid-summer Sale, New Skins, and More!